Smart clothing only works when all the enabling technologies work. Just like zippers, buttons and thread support our passive clothing, new technologies that bridge apparel and electronics can support our active clothing. Smart clothing only works when all the enabling technologies work. Just like zippers, buttons and thread support our passive clothing, new technologies that bridge apparel and electronics can support our active clothing. At Loomia (the company where I work and play), we focus on developing technologies and products that can make our clothing smarter. I think great materiality is important to this industry, so stretchable, direct to fabric conductive inks useful in the sense that they support making circuited clothing feel like normal clothing. Stretchable inks are normally deposited onto TPU . (thermoplastic polyurethane) and then onto a textile. It sounds like a promising solution, but there have been strong arguments made by Rebeccah Pailes-Friedman and IDTEch Ex Researchers that TPU can pose a problem. My teammate, Ezgi Ucar and I decided to play around with some of our ink formulas to see how they would do deposited onto a stretchy textile. 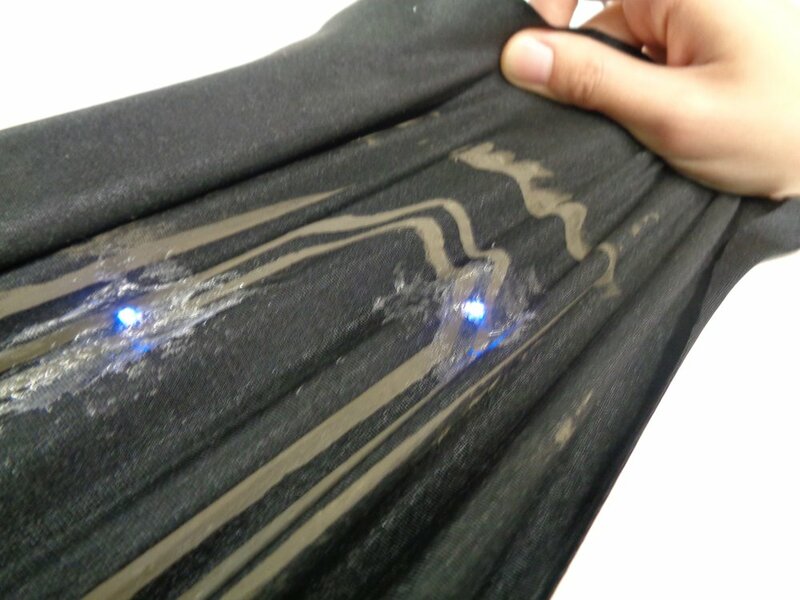 The images and video below show visuals of a highly stretchable and conductive ink that we developed that can be deposited directly onto lycra fabric. We have a lot of work to do to get something like this ready for mass production, but experimenting with what's possible is key to crafting good solutions.